Aw, look at me so happy. I like this picture a lot. I usually wear knee-high leather lace-up boots, but they are at the cobbler's this week getting re-soled. 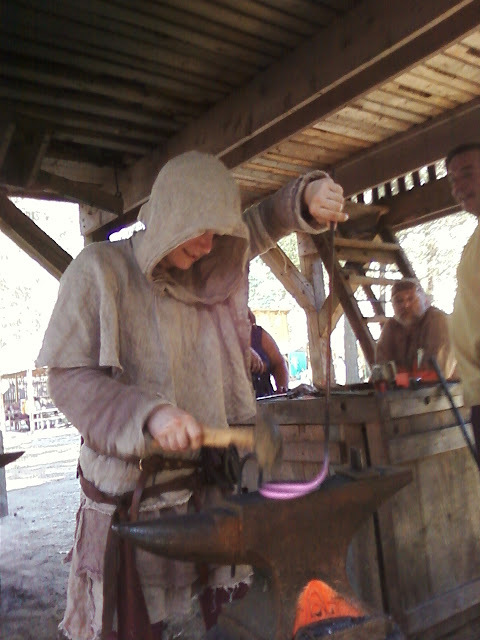 I did blacksmithing this past weekend for the first time!!! My life is so awesome. 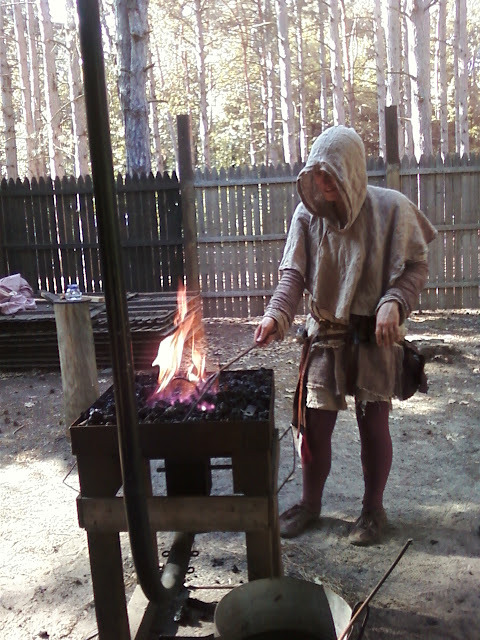 For those who don't know, I'm a member of the Society for Creative Anachronism (SCA.org), which is an amazing medieval recreation group. It's an international organization filled with people who like learning about old things, including medieval crafts like blacksmithing. The world is broken up into kingdoms (yes, with royalty that change every 6 months - you win the crown by winning tournaments of heavy armored fighting or fencing). This past weekend I was at one of our events called Tyger Hunt. The name comes from the fact that our neighboring kingdom, the Kingdom of the East (which is the upper east coast of the USA), has the Tyger as its symbol. The Middle Kingdom, where I live and encompassing Michigan, Ohio, Indiana, Illinois, and a bit of Canada, has a dragon as our symbol (our war cry is Draco Invictus - dragon unconquered). So, inhabitants of the Middle Kingdom "hunt the Tyger," as it is our "enemy" in our biggest event of the year, the great Pennsic War in August (imagine almost 12,000 people camping in medieval gear for two weeks, taking and teaching hundreds of classes and having giant melee battles with hundreds of fighters [heavy armored fighting, fencing, and archery] on the field battling for war points). Well, usually they are our enemy - this year we're fighting with them on our side against everyone else that shows up for a change. Anyway, you should check out your local chapter if you're interested in learning medieval stuff from really cool people! You get to do and see so many fantastic things, and for next to no money, as everyone in the society is there, volunteering their time to teach others. 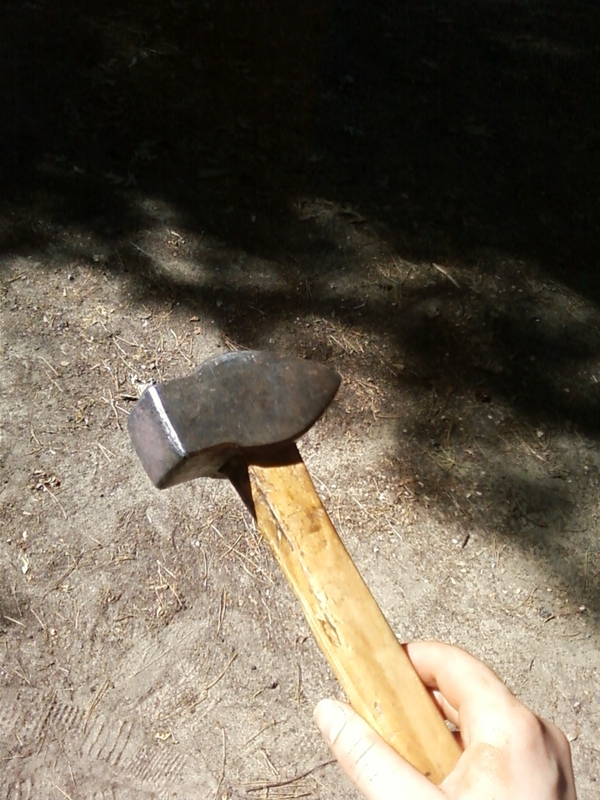 How much did it cost me to do blacksmithing? Well, some gas money to drive to the event, and the site fee was $10. Of course, that $10 covered the entire day - I fenced in tournaments for several hours in the morning, then shot some archery at the archery range, and then did blacksmithing. The lunch tavern had a very filling meal for $5. 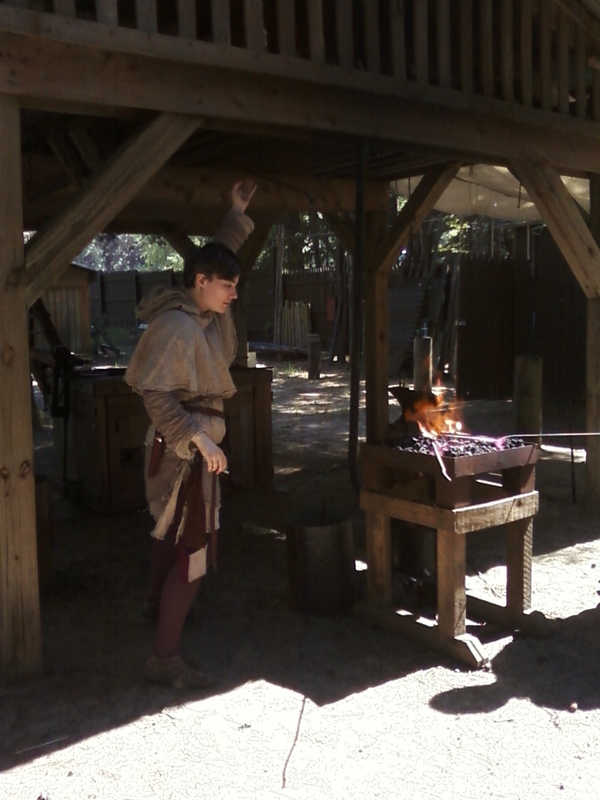 There was also spinning, weaving, and woodworking you could learn from craftspeople. 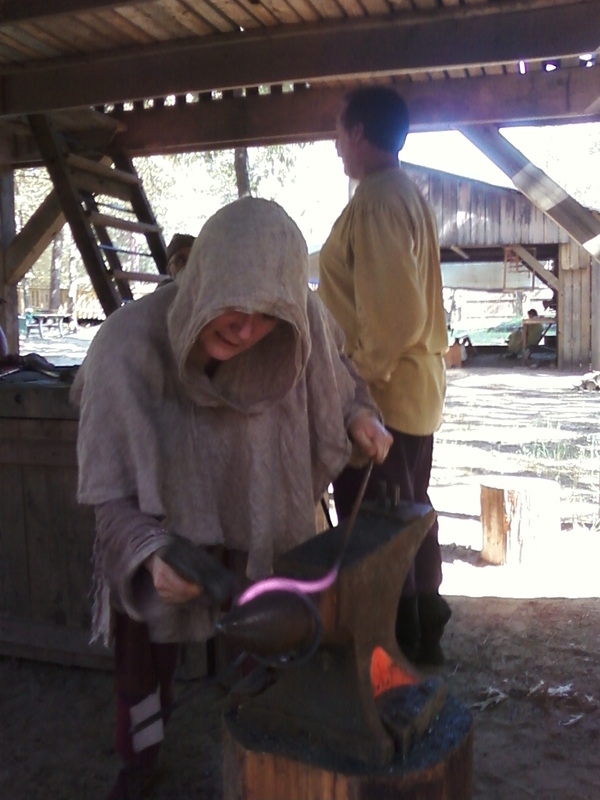 I was taught the blacksmithing for free, and the materials were free as they were provided by the site. 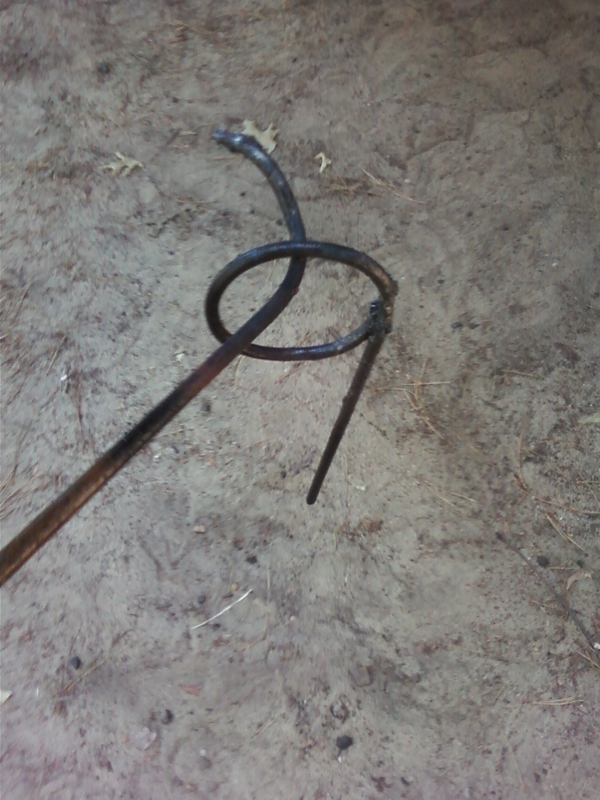 So it arguably cost me a couple dollars to learn some blacksmithing and then take home my creation. You really should check out the SCA if you're fascinated by it! You can start by going to local group weekly meetings, like craft night or fencing practice, where you don't need to wear garb (the medieval clothes) and can meet people in a fun, unstructured environment (and these meetings are usually free). Your local group should also have a Chatelaine, who is responsible for introducing new people to the group, and a Gold Key, which has loaner garb for people who don't have their own. Okay, I can be done trying to sell you on the SCA for now. Click on the jump to see more sweet pictures of me blacksmithing and see what I made! Tyger Hunt is a particularly cool event, as it's held at this fantastic boy scout camp that has a built in fort with a forge, woodworking area, firepits, etc. It's a lovely smallish event with lots of cool things going on at it. I'm pumping the bellows in the picture above. By pulling down on the lever, I am compressing a giant sac in the area above us that is filled with air, which pushes the air down the metal tube and out underneath the coals. The coals need to be kept really really hot to be able to heat the metal efficiently, and pumping the bellows gives the fire the rush of air that it needs to breathe and get really hot. My project started as a long metal rod. It is currently heating in the coals, heating up the area about a foot from the end of the rod. 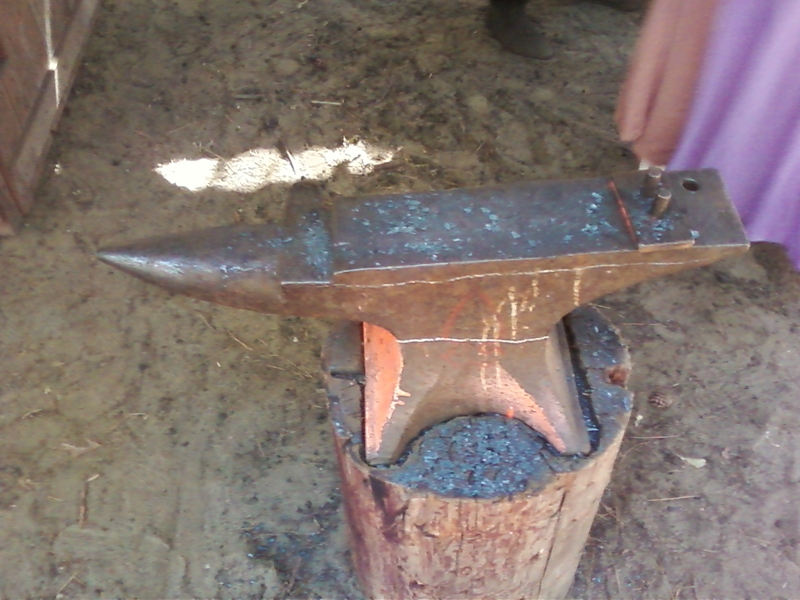 After heating the rod, I took it over to the anvil (above). The flat part can be used for flat hammering. I started by using the two pegs at the end. By inserting the hot part of the rod between the two pegs and turning, you can create a bend in the rod! Then you can inch the rod a little further in, and bend it some more. I did this several times - heating the rod, and then bending it - until I had made a circle. That circle wasn't the best circle, though - some parts where bent too far, with others not enough. So I slipped the circle over the rounded end of the anvil and used the hammer to round the circle out. You can see the metal is red-hot where I'm hitting it! It's so amazing to be able to bend and shape metal so easily when it is hot. And then... I wasn't paying enough attention, and I left the rod in the coals for too long. When I went to pick up my rod, only half of it came up! The metal had gotten too hot and turned so brittle that is snapped in half. So I started over with a new metal rod, and made that circle again. Woo! 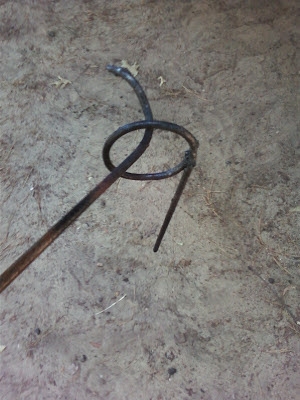 Heating with the forge again - you can see the circle in my rod near the coals as I shove it in. I forgot to put my hood up here, and I'm squinting in the sun. I love my archer's hood - it keeps the sun off my eyes, neck, and shoulders, and keeps me cooler than if I wasn't wearing it. Here I have the finished circle on the end of the anvil (there's a second anvil, which is why the background looks different here). You can see that I have also bent the circle so that it is perpendicular to the long shaft of the rod. I did this with the two-peg anvil adapter in the same way that I bent the rod into the circle shape - I just didn't bend it all the way into a circle. I am evening out the curves in the metal here. Back in the flames again! I had to heat the thing up at least a couple dozen times before it was all finished. 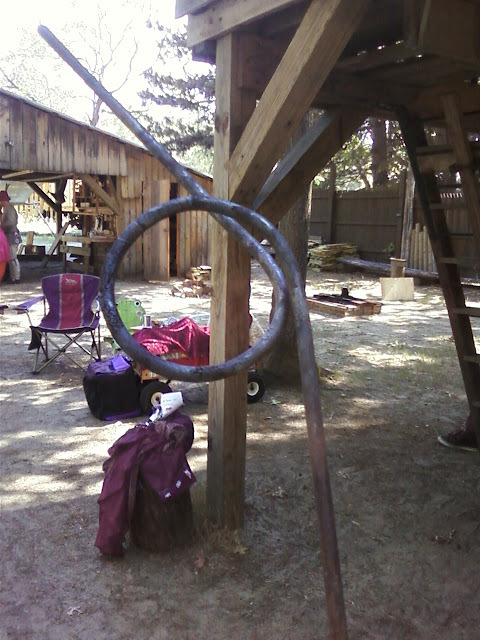 Next, I bent the small portion of rod on the far side of the circle into a U shape using the two-peg adapter (you can see the U facing me - kind of being hidden by the hammer). Shaping the U bent the initial circle a bit, so I'm hammering that back into being flat and circular. If you look really closely below the circular portion of the anvil straight down from the U, you can see the tip of the metal rod that extended from the U shape. This is longer than I wanted it to be (I wanted it to end shortly after the U), so I needed to chop it off. I don't have a picture of this, but I circled the piece in the picture above. See the piece that comes to a point in a kind of triangular prism? The square rod on the bottom of that fits in the anvil where the two-peg adapter was sitting in previous photos. I made the end of the U shorter by placing the red-hot rod on top of the triangle point and hammering it - it cleaved the rod in two in that place. After that, I curved the end under so that it wasn't a sharp piece sticking out. The final thing was to finish the other end (the end I've been holding the entire time), as I want to be able to drive that part of the rod into the ground. I plunged the worked end of the piece into a bucket of cool water and left it there for a few minutes so that the piece would could be handled from that end. Then I made a taper on the long end by repeatedly heating it in the coals and hammering it flatter, frequently turning the rod so that it ended up tapering to a blunt point (picture later). I could not have done any of this without the generosity of the skilled volunteers in the SCA, and especially without Jacques. He's the guy in the photo above, and he was a fantastic teacher - patient and interested and really good at explaining what to do. He would show me (and others who were making things for the first time, like Zaynab above) just enough of the technique so that I would get it, and then let me take over and do it myself. 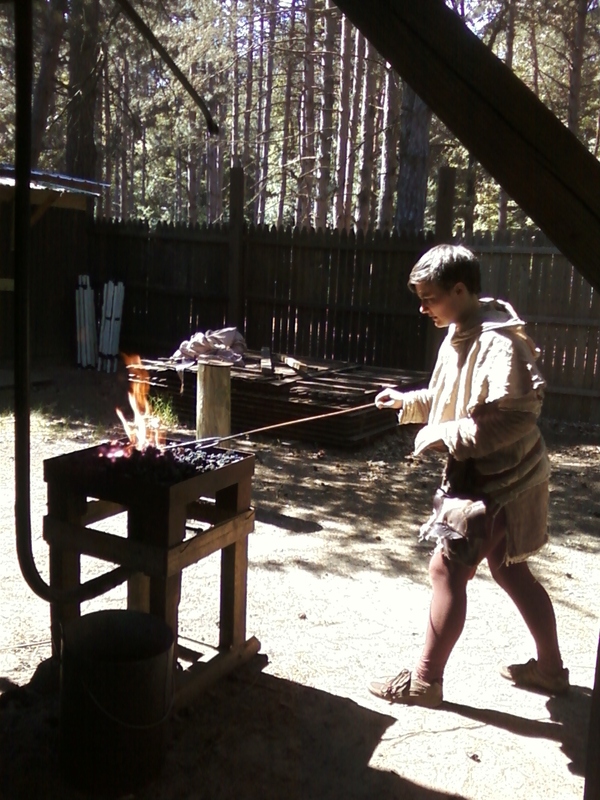 I am so happy that people like Jacques exist within the SCA - what a fantastic experience, being able to learn how to blacksmith a bit on a weekend, essentially for free. I don't know if he'll ever read this, but thank you, Jacques! The finished product!!! It's a arrow and bow stand! Pictures of it in use are down below. 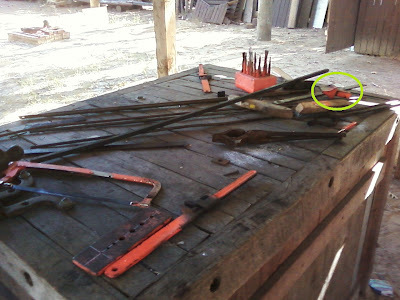 Haha, my fingers are still all red in this photo, taken a few hours after blacksmithing. 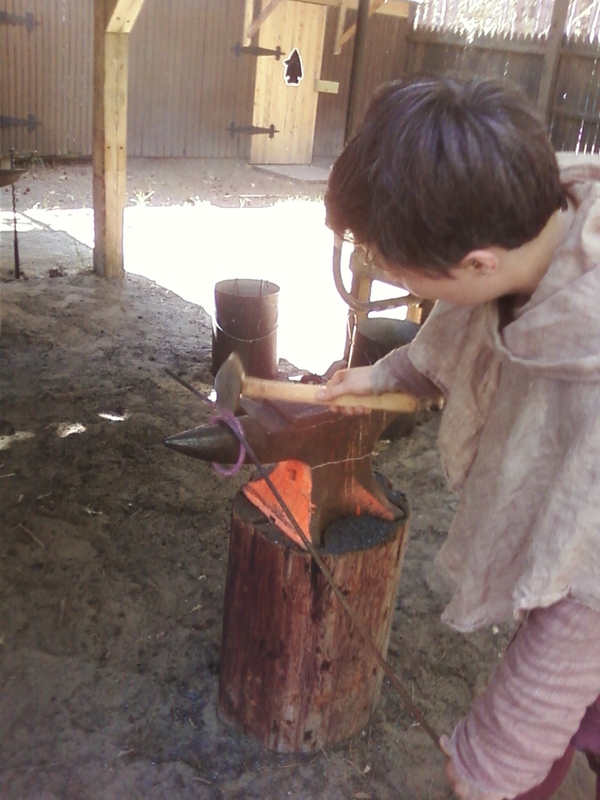 I did not notice at all until I had completely finished blacksmithing, but my fingers were not used to gripping a rod so tightly for a while, and they were red and sore for a while afterwards. A close-up of the tapered tip that goes into the ground. ...and I could have left you with that beautiful picture of the arrows and bow, but instead you get to see how dirty my feet got. The shoes I wore were a pair of DeForest's (yes, we have the same shoe size, amusingly), and they were the ultra-breathable kind that have mesh over half the shoe. I had spent the day walking around on dusty ground, and I had practically fenced in a sand pit, the grass was so dusty and worn away in places. I poured a substantial amount of sand out of my shoes at the end of the day, and my feet were filthy, haha. 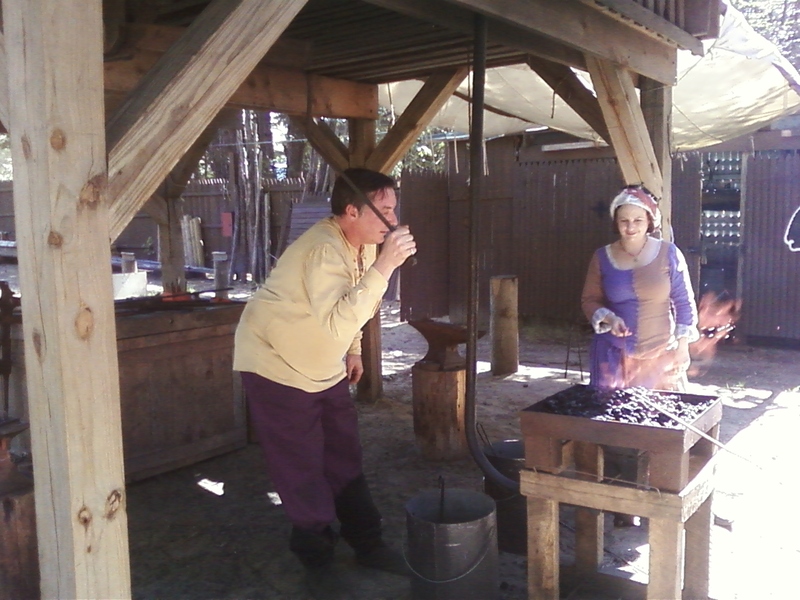 Tyger Hunt was a blissfully happy day - thank you, Barony of Northwoods for hosting such a fantastic event!